Because safety is a moral obligation. Safety defines our company. 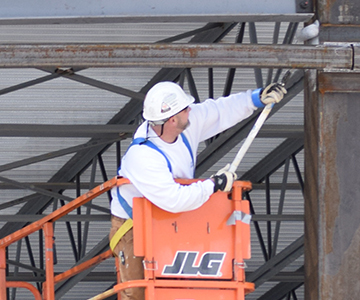 We’re known as one of the safest contractors in the industry for a reason – because before we ever pick up a brush, paint can, pencil, or pen, we think about how to keep our employees safe. We believe we have a moral obligation to ensure that each employee arrives home safely. This initial training usually takes about four days, after which additional training takes place in the field. All new hires undergo a physical, and receive a pulmonary function test to ensure they are physically able to wear a respirator. Employees are also given fit tests and respiratory protection refresher training annually. At ACE, we know our strength lies with our employees, and we strive to keep them safe. ACE won an ABC Platinum STEP Award for three consecutive years—2015, 2016, and 2017—recognizing ACE as one of the safest painting and wall covering contractors in the nation! The business that Eric Vogell has grown into a large Maine contracting company started out as a summer job for he and some friends.